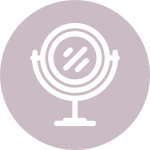 At Kittridge Dermatology, all new cosmetic evaluations involve a consult with Dr. Kittridge. During this consult it is our goal to find out what your skin concerns are and create a plan to get you there. As a board certified dermatologist, Dr. Kittridge completed a residency exclusively in dermatology, including a broad spectrum of cosmetic dermatology. Dr. Kittridge has continued her aesthetic training after residency, learning from innovators in the industry, to continually finesse her skills and provide her patients with beautiful and natural cosmetic outcomes. All services rendered at Kittridge Dermatology are performed by Dr. Kittridge. Dysport®, BOTOX Cosmetic® and XEOMIN® are trade names for highly purified proteins that are used in extremely small doses for certain cosmetic procedures and medical conditions. When you frown, concentrate, squint, or raise your eyebrows your muscles contract causing folds or wrinkles in the skin. With time these wrinkles become noticeable even at rest. Neuromodulators such as Dysport®, BOTOX Cosmetic® and XEOMIN® are injected into the muscles under the skin to temporarily relax the unwanted lines caused by facial expression. These products are typically used in small doses to eliminate unwanted frown lines between the brows, horizontal forehead lines and crows feet around the eyes. Neuromodulators can also be used as a non-surgical option for a brow lift, to correct the down-turned appearance of the corners of the mouth and smooth the lines around the lips made from pursing movements. Muscle function gradually returns over a period of three to five months. Combined with fillers, these treatments may be even longer lasting. Neuromodulators may also be used to decrease excessive sweating of the axillary area, also known as hyperhidrosis. Treatments last on average 4-6 months, but may last longer in some patients. Restylane® is an injectable hyaluronic acid filler that occurs naturally in the skin. Restylane products can restore lost tissue volume and enhance hydration, resulting in more youthful, healthier looking skin. Restylane is particularly good for smoothing fine lines, augmenting lips and filling in wrinkles or facial folds such as the lines from your nose to the corners of your mouth (nasolabial folds). The Restylane family of products include Restylane®, Restylane-L®, Restylane® Lyft with Lidocaine, Restylane® Silk, Restylane® Refyne, and Restylane® Defyne. Refyne and Defyne were recently FDA-approved for laugh lines and fill skin folds with a soft, natural appearance. JUVÉDERM Ultra XC®, JUVÉDERM Ultra Plus XC® and JUVÉDERM VOLUMA XC® are composed of naturally occurring hyaluronic acid and therefore have a low risk of allergic reaction when injected into the skin. These products can be used for contouring and volumizing the cheeks, augmenting the lips, diminishing the lines around the mouth, and in correcting some scars. These products can last on average 6-12 months, but may last even longer in some cases. BELOTERO BALANCE® is a hyaluronic acid injectable filler similar to JUVÉDERM® and Restylane®. Because hyaluronic acid occurs naturally in our skin, there is a low risk of an allergic reaction. BELOTERO BALANCE® is unique in that that it completely integrates into the skin tissue to specifically treat those small etched-in lines and wrinkles such as vertical lip lines above and around the lips. This product is specifically helpful in creating a ‘finished look’ by erasing those fine lines left behind after the larger volume deficits are corrected by other fillers. RADIESSE® is a filler made of calcium hydroxylapetite microspheres. This product is ideal for volumizing the cheeks and correcting deeper wrinkles of the face. It is the only product indicated for rejuvenation of the hands. The skin of your hands is one of the most visible parts of the body. Now we can rejuvenate the hands to match your youthfully rejuvenated face. KYBELLA® is the first and only FDA-approved, non-surgical treatment that reduces the fat under the chin. KYBELLA® contains is composed of a naturally-occurring ingredient called deoxycholic acid, which is produced by the body. It is injected into the submental area where it destroys fat cells resulting in a reduction of fullness under the chin. Once destroyed, these cells can no longer store or accumulate fat. If you have submental fullness or a “double chin” we can now treat this area non-invasively with KYBELLA®. It is important that you find a board-certified dermatologist that is well trained in this technique. Call Dr. Kittridge to schedule your consultation. Platelet-Rich Plasma is the concentration of platelets and growth factors found in the blood. PRP involves a process where a small amount of blood is drawn from the patient’s arm during the office visit. The blood is then placed in a centrifuge which separates the red cells from the clear platelet-rich plasma. The clear PRP solution can be injected or rubbed into the patient’s skin. Since the PRP solution is isolated from the patient’s own blood, there is virtually no risk of an allergic reaction and the treatment is completely free of chemicals or additives. By adding PRP to a micro-needling or or other skin resurfacing procedure, wound healing is accelerated and increased collagen production is observed. As a result, wrinkles and scars are minimized. PRP has also been shown to promote new hair growth, thicken thinning hair and increase the overall health of the scalp and hair. PRP delivery to the scalp is performed via injections. Automated micro-needling, also know as Epidermal Collagen Induction (ECI) therapy, is an innovation in aesthetic medicine for the treatment of fine lines, acne scars, and the improvement of the skin’s pore size, texture, tone, and color. Micro-needling creates microscopic channels in the skin using a specialized (disposable and motorized) tip with fine needles. Similar to how aeration of a lawn leads to growth of healthy grass, the micro-injury (virtually painless) from micro-needling serves to stimulate the growth of new collagen and elastin. Additionally, channels are created for the delivery of natural growth factors, your own platelet rich plasma (PRP), which further enhances the collagen stimulation. Micro-needling can be used on all skin types and on all skin pigments. Recovery is fast – a matter of a few days during which time the treated skin appears pink in color while it is being repaired from within. Patients notice an immediate “glow” to their skin but other visible changes to the skin develop over the course of several weeks as the skin remodels. Results can continue to improve for up to 6 months after the last treatment. Dr. Kittridge typically recommends treatments 2-6 weeks apart depending on treatment goals. This is one of Dr. Kittridge’s favorite procedures! As a member of the International Peels Society, Dr. Kittridge has worked directly with leaders in the field from around the country to adapt extremely effective, efficient and safe chemical peeling techniques. Chemical peeling is an art and a science. It is not a one size fits all approach. Dr. Kittridge will assess your skin type and your concerns and create a custom plan for you, often combining several different peeling agents to optimize your outcome. To enhance your results, she will provide you with a pre- and post-treatment skin care regimen that often includes custom-compounded medications. Recovery time varies from a few days for superficial peels to several weeks for deep peels. Dr. Kittridge personally preforms all peels.